It was a five star experience. We had a wonderful trip. The linen pricing is insane! It should be put into the original contract as part of the rental price. $45.00 plus tax for each room is absurd. There were 4 beds. $135 plus tax and athe rules of returning them was more than with us bringing them and treating ourselves to an extra lobster dinner. They all were great and wonderful representatives of a very special part of Maine. Loved the whimsy of the house, the art and the owner's obvious love for it. Very grateful that your team arranged a suitable replacement, when the original property we reserved became unusable just a week before our scheduled vacation. 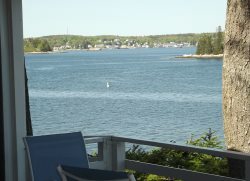 We should have stayed longer, because there is a lot more to see and do along Maine's coast. EXCELLENT, SUPERB, LUCY WAS THE GREATEST!! GREAT....MET THE EXPECTATIONS OF EVERYONE IN MY PARTY!! Our stay in the Cozy Cottage was delightful! I went with a group of girlfriends and we enjoyed the beautiful tranquility of the home looking across at the bridge and waterway from the sunny front room. It was so peaceful and relaxing to read in the morning, then get busy with the days activities. The kitchen had everything we needed and beds were comfortable. Plenty of dining options nearby for evenings that we decided to eat out. Home is charming in decor and outdoor picnic table would be great for families. This is a warm and welcoming space to enjoy. My husband worked with Lucy by phone. Never a single problem..smooth. She was friendly and very accommodating with our questions and her suggestions. Thank you, Lucy. This was positively the first time that we came home revived from a vacation rather than exhausted. It was relaxing and invigorating. We loved watering the gardens, videoing the humming birds, watching the seals and even climbing the steps up from the river..nice little workout. Your home had everything that we needed in the lovely kitchen and was provided. We love to cook together and we did that a lot. There are just so many things to expand on as it was just perfect for us. The restaurant right down the road saves a drive into town and is very nice, The Tarbox, I believe was the name. The air is so fresh and clean, I wish we could have bottled it and brought it home. We did not want it to end. Will be back in the fall 2017 to see the leaves change. Thank you to our hosts. Had a good week just wasn't long enough. The location and historical artifacts allowing us to go back in time and imagine what it was really like was very enjoyable. There is plenty of room on the property for grandchildren to play. Loved the boathouse for leisure time. You all are terrific---very helpful and generally quick to respond to any questions! Ledgemere has a stunning location with spectacular water views of sunrises and sunsets on rocks that are flat enough to safely explore. Nearby cove is quiet and perfect for shell and rock collecting. House itself has expansive windows, inviting screened porches, and generously-sized bedrooms. All in all, a terrific property! Lucy and the team are awesome. Very organized and always available to answer questions. Very pleasant and fun to work with!! Breathtaking view and beautiful cottage. So much attention to detail that we didn't need to ask for a thing. Very relaxing and comfortable. We definitely felt at home and we loved the enclosed front deck of the cottage. We sat out there many a night just watching the water and the boats with the nice breeze. Very enjoyable! The team was all delightful and always got back to us in a timely manner on any questions that we had. Cottage Connection led us to a little slice of heaven that we now look forward to returning to next year. I can't imagine anything better really. Really excellent staff- had some specific questions before arrival, all of which were addressed in a timely fashion by multiple members of the team. Check out instructions were clear and reasonable. This property was exactly as advertised, and had all essentials for a memorable trip. The location of The Haven was really excellent. Wish we could've stayed longer! The team was always helpful. Always pleasant, eager to make our stay one to remember. The Cottage Connection will take care to help make your vacation one to remember. I would use them again. It was a pleasant and relaxing visit. We loved the property. The bed sheets were very nice and fresh. The house was clean and everything we needed was there. The view was wonderful and the people on Five Islands and Georgetown Were very friendly. we hope to rent this lovely house again. Team was fine, but a call about bees was lost. The rustic fisherman's house with the authentic Maine atmosphere was just what we hoped for. The beach provided easy kayaking to the nearby islands and a great place to play. The property was private but close to town. It was a perfect place to get our whole family together.